It is really important the methodology of teaching for learning a foreign language and to include providing opportunities to illustrate the actual process of communication in Spanish, and creating an educational environment that provides real conditions for learning use of the target language – Spanish and its culture. But the new technologies and the new multimedia learning tools make this process much more effective and funnier. The course will boost your confidence in using technology in your lessons and will encourage you to explore and experiment with digital tools to enhance your teaching. You won’t just be learning about technology in the classroom, you’ll be putting into practice what you learn on a daily basis so that when you return home you will be able to start using this new knowledge in you own classes. What’s more, to ensure you continue to develop your skills in teaching with technology we’ll also teach you how to share resources, links and ideas on a closed platform, so the opportunities for learning and sharing will extend well beyond the classroom walls long after your course has ended. Also, as we mentioned before, we will teach our own methodology of Spanish teaching, native teachers with years of experience will help you to improve and develop your Spanish lessons. 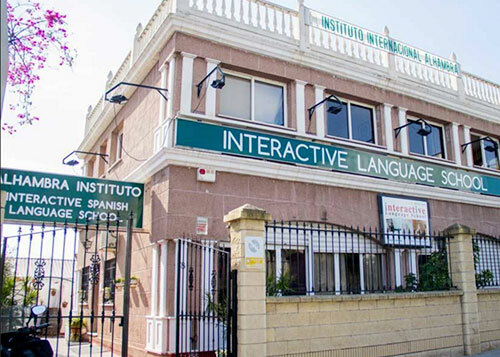 Alhambra Instituto is the first language school in Malaga,Spain dedicated entirely to Spanish courses for foreigners, with the use of interactive multimedia whiteboards in every classroom. Interactive whiteboard ‘increases enjoyment of lessons for both students and teachers through more varied and dynamic use of resources, with associated gains in motivation.This technology allows: improvements in the process of organic combinations of traditional and innovative forms and methods of education; implementation of training, information, games, modeling, design and analysis functions; performance of such principles as visibility and accessibility; feasibility of systematic transition from education to self-education; creation of a positive emotional background for learning; and linking theory with practice. The use of Interactive whiteboard technology creates the most favorable conditions and contributes significantly to motivation in learning foreign languages. With practice you will realize how the Interactive Whiteboard gives you the possibility of improvising in the class, search on Internet, pictures, examples, videos, games, activities… your classes will gane much more introducing the new technologies. · Customizing, managing and saving toolbar profiles. The IWB (Interactive Whiteboard) is the new frontier in language teaching. The IWB revolution is now sweeping into language classrooms, but many teachers are still unsure and afraid of the multi-sensory potential of the IWB or simply lack sufficient IWB skills training. This course covers IWB methodology and pedagogy through a combination of lectures and practical work-shop sessions using the Smartboard from Smarttech + SMART Notebook software and Promethean ActivBoard Touch. We take a look at how to incorporate the IWB technology in combination with task based language teaching (TBLT) to create student centred lessons which will motivate and stimulate your students’ learning skills. Programme of the training activities day by day: Please note this is an example of a daily programme. Course content may often be usefully adapted to incorporate the needs of each specific group. This course it will only have place with groups of school teachers. On the final day all participants will be asked to present and share the resources they have created and give feedback as to how these resources can be applied to their own teaching situation. Open discussion within the group and Trainer feedback will be given accordingly.